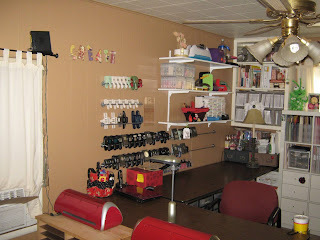 Okieladybug's Scrap N' More: Reorganized Craftroom - PICTURES!! 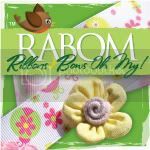 I was going to wait and schedule this post for morning but I thought I would go ahead and let it publish now since I know how much we all like to see each other's craft spaces! There is still a lot of work to do but nothing that can't be done over a period of time now that I have all the shelves and drawers in places where they will be. But then again we all know I am in a constant flux of reorganizing my room!! 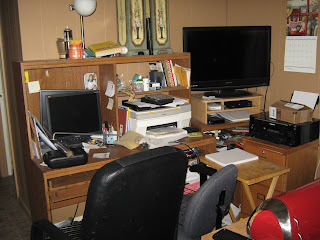 First off I am going to show an honest picture, a terrible picture...the picture of my old computer desk! I will be getting rid of this desk soon and need to start going through the stuff in and on it. There won't be anything on that wall as I plan on putting my yellow comfy chair in this area. I will be sure to post pictures when I get that done. Okay, everyone at once *okie holds up her hands like she is conducting a concert* OOHH AND AAHHH! 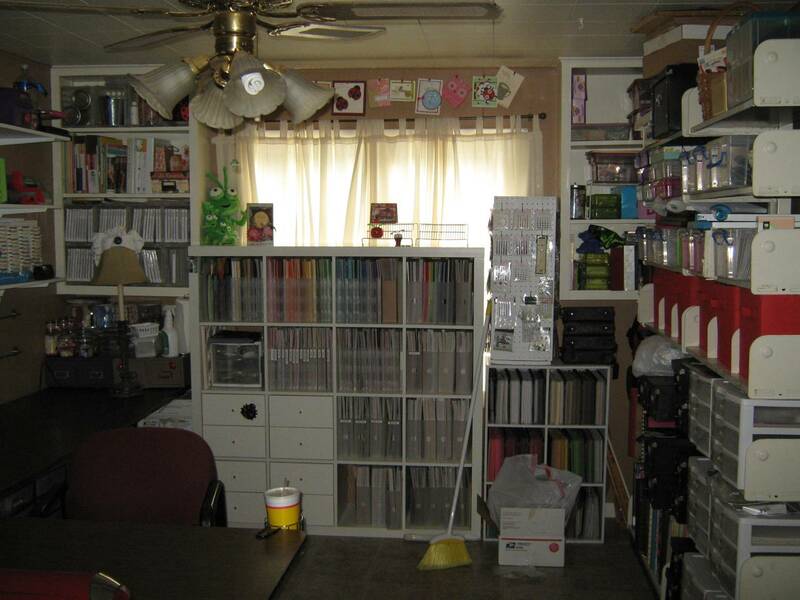 This is the view you see when looking into the craftroom from the living room. I use to have the white shelves above the table there before but I did move them over a bit so I can access the built in shelves easily. I also moved my punch bars to where I can reach them very easily. This view is if you are coming into the room down the hallway from the kitchen. Of course the broom and box of trash won't be staying, I forgot to move them for the picture. I d.o like my Ikea unit in front of the window. While there were comments about me losing my natural lighting in the room you can see there is still lighting that comes in. I will be getting rid of the revolving peg board in the future after I get some more pegboard cut to fit the end of the new shelves. On the Ikea Expedit unit I used heavy cardboard across the back so the sun doesn't fade my paper on the shelves. This is another view from the hallway and shows the extra table space I now have along the wall where the Ikea unit use to be. 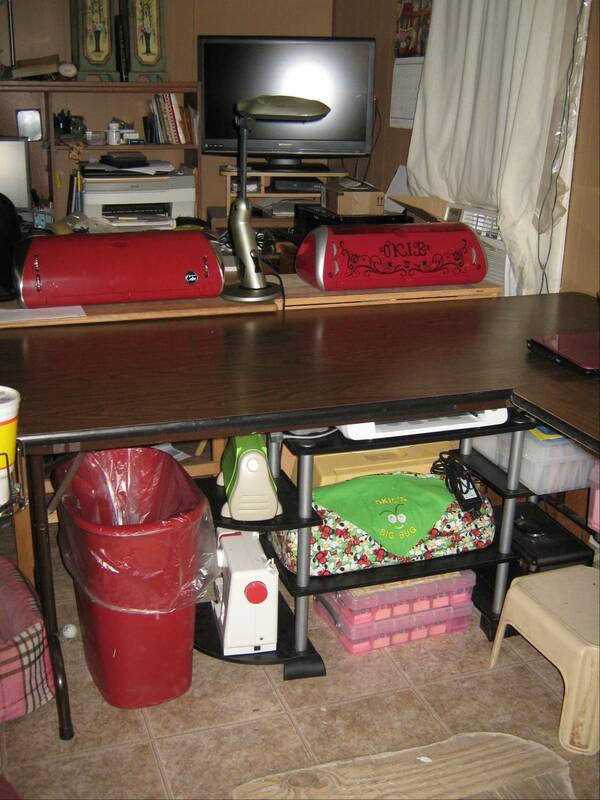 I often had problems finding space to lay things while I was working and this will resolve that. I would like to get another Sunlight lamp for my area but I don't think my Walmart carries them anymore so for now I just have a regular table lamp. I might look for an under the shelf lamp and place it on the shelf right above the punches. Here is a picture of the new shelving from the opposite corner of the room. I can't believe how much I was able to get on the shelves. 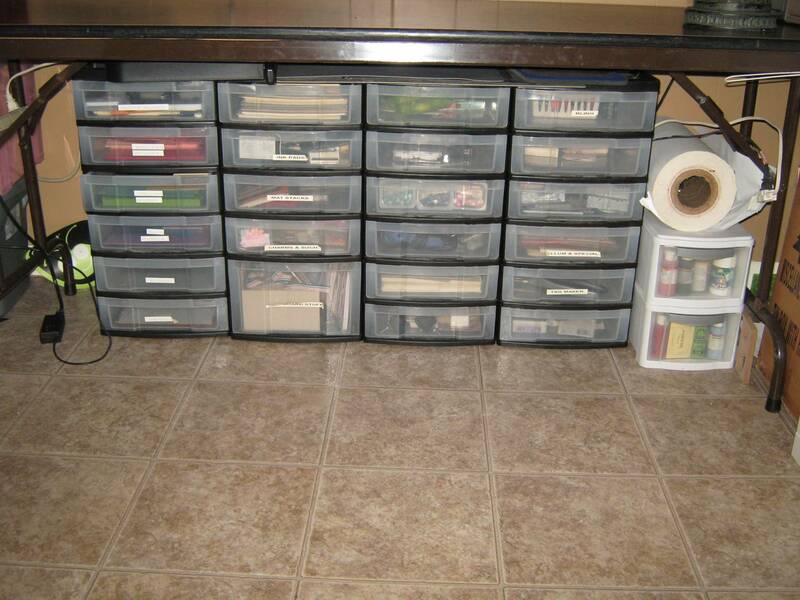 I will likely work off and on with organizing everything on there. 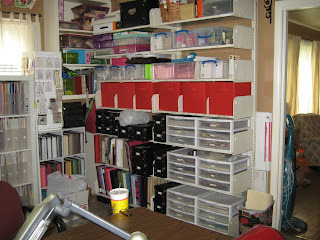 I do like my red cloth bins on there as well as my themed paper drawers. I use to have a desk in this corner and it there was crap piled on the top and totes under it. I emptied the contents of the totes and organized it all on the shelving so now I can get to it easy and not have to work a jigsaw puzzle to access things. This is my main work space and always has been. It gives me a good line of vision to the television and also into the living room, not sure why I think I need to see in there but when my daughter was small I needed to see in there quite frequently. 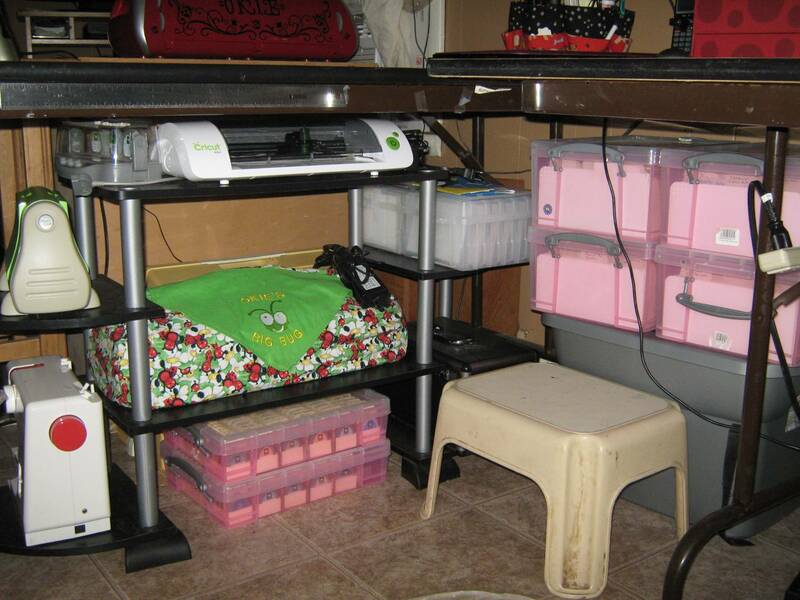 I have set out my Cricut Cake machine on the table so I can start using it. If you look in the bottom left hand corner of the picture you can see the pink and brown plaid dog bed. 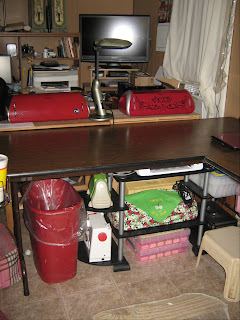 That is where Lucy likes to stay most of the time when I am in the craftroom. Also on the left you can my cup, I got one of those cup holder things last year in Houston at CKC and I love it!! I don't ever worry about spilling my drinks on my projects anymore. I have my Cricut Mini and E2 under the table along with my Cuttlebug *okie sighs and feels sad since the end busted off and she hasn't tried to see if it works or not*, Janome Sew Mini, ProMarkers, Cricut Cartridges and a photo storage box. The shelf unit was my daughters, she got it at Family Dollar and used it as an entertainment unit but since moving back home she didn't need it anymore. I will probably move my photo box and ProMarkers to a different area. 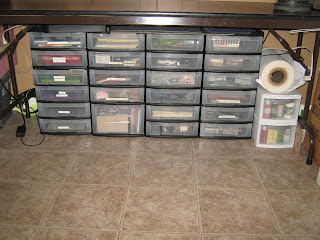 The grey tote has vinyl in it and the boxes on top of it are my Cricut handbooks. I can grab the other machines easily when I want to use them. I took the rollers off my drawer units so they don't roll out when I open the drawers and also so I could get all 4 under the table and still open the drawers. I will have to go through these and reorgize the contents and relabel the drawers, but that is something I have needed to do for quite some time. They use to be under the table where my other machines now sit. This is a little box that my friend GrammaT sent me years ago and I now have it on the table and I put my most used tools in it. Like I said, I still have a lot of reorganizing to do but the hardest part is behind me and I can take my time doing the other stuff. I thought I was going to go crazy with everything in such a disarray for the period of time it was. I love keeping my craftroom in a fairly orderly manner and feel a lot more relaxed now that it is a workable space. Okay now I am off to see what else I can move around!! HA HA HA On come on ya'll...you knew that was coming!! Okie, love your room.....one question....Is the Ikea Book Shelf in front of your window open back or closed? If open back, the sun could ruin your papers. 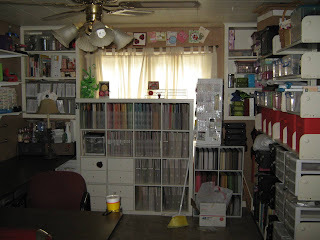 I have open back shelves in my craftroom. I don't keep paper there, but do keep the canvas bins....they have faded slightly due to the sun, but everything in them is fine. Just thought I would relay info. from my experience. Thanks for sharing your craftroom with us! Donna I put heavy cardboard on the back of it to prevent the sun from fading my paper. I forgot to mention that in the post and need to go back and edit that so folks don't get worried LOL. Looks great! I just bought a sunlight lamp that clamps on the side of my desk. I got it on clearance at Hobby Lobby for $9.35! Phew...glad to see you weren't arrested.. LOL. Great organizing. 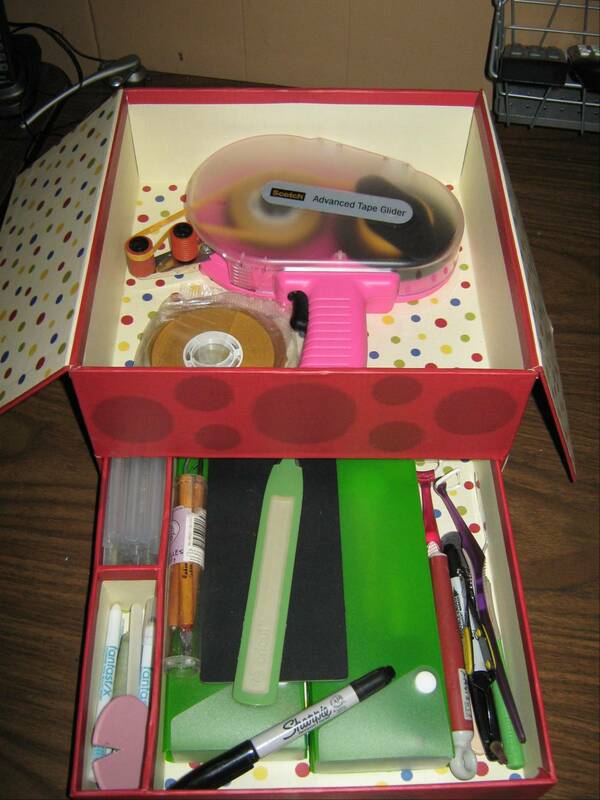 Where have I been that I didn't know that you now have an E2, mini and cricut cake? those shelves are a perfect fit. nice room. 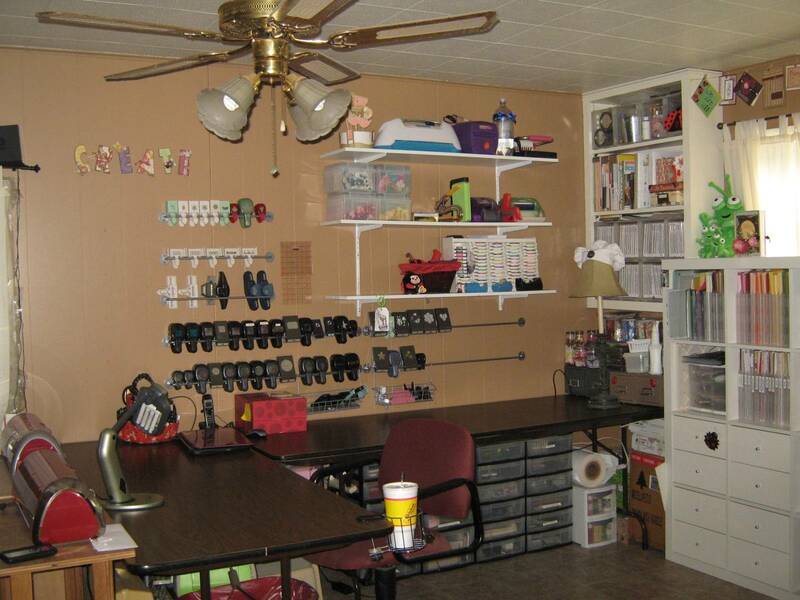 now you can get back to doing what you love to do....looks like a fun place to craft. Thank you for posting this. I'll be starting to convert my daughters old bedroom to my craft room this Fall when we get home. 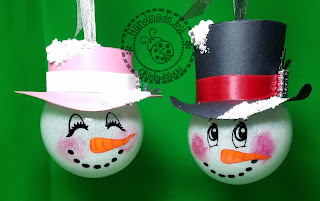 I got some great ideas from this....looks amazing!! Good job! Great work and so fast too. I know I need to do the same since it takes me nearly a week to pack for my get-away scraps 8~/ Then I come home and just plop my stuff on the tables and stash the rest in drawers and under other crap.Love your punch racks.Ikea is super! Super duper Okie! Someday mine will be reorganized and pretty too! 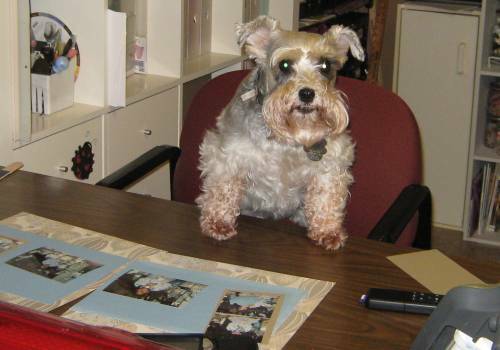 Razzi wonders when Okie is finally going to come visit and help her!!! WOW! 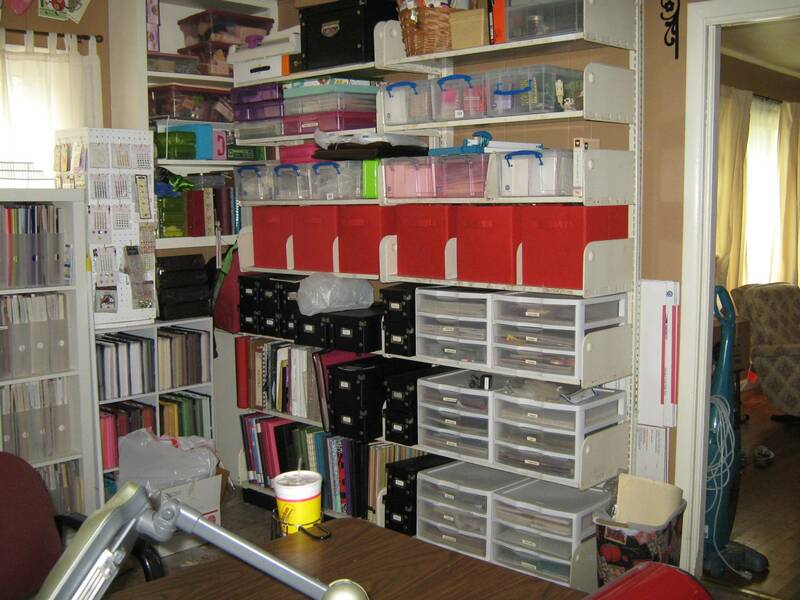 Fabulous job Shirley, you are the most amazing organizer I know, and I am more than a little impressed ... not just with the incredible arsenal of crafting supplies (which is definitely impressive), but with how quickly you've managed to complete this task. I honestly belive it would have taken me weeks to accomplish what you have in just a few short days. BTW ... just curious, do you have enough leg room to sit at your tables to craft? It's difficult to tell true depth from a photo. I do hope you have enough space to be able to craft comfortably. Bravo, to you on a another great job. Everything looks so clean and fresh and organized ... and it looks like a fun room to craft in. Awesome Job...now just to make my room bigger to hold all my "chit." Looks marvelous :-) You inspired me to organize my craft room! Went to Ikea to get tables and I'm rollin'! Thanks a bunch!!! 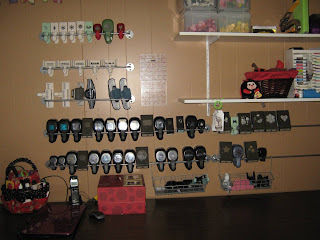 You worked your tush off getting all organized and it (the room) looks great!! !